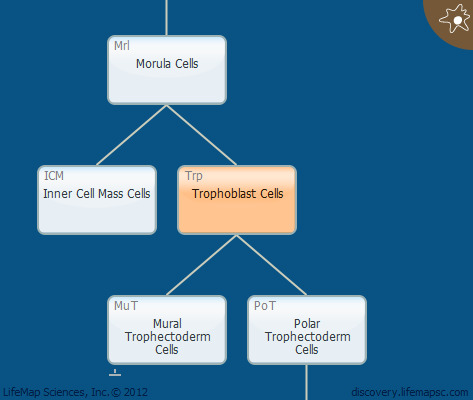 Trophoblast cells will give rise to the placenta and most of the extraembryonic tissues. In mouse trophoblast development, the top of the transcription factor (TF) cascade is ruled by Tead4, which, in turn, controls Cdx2, Eomes and Tcfap2c. Further downstream, other TFs that play an important role in normal trophectoderm development include Gata3, Elf5 and Ets2. Trophoblast cells are characterized by lower methylation levels than those measured in inner cell mass cells.